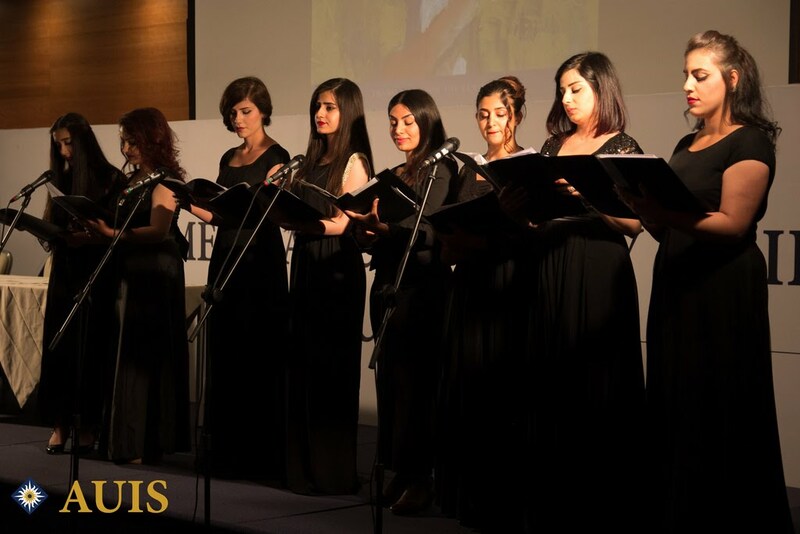 On April 25, 2016 American university in Sulaimani hosted a poetry-reading event that marked the release of the book Handful of Salt by Kurdish poet Kazhal Ahmed.and The event brought together AUIS and the College of fine arts / University of Sulaimani to celebrate women’s achievements. Outside the hall where the reading took place, was an art exhibition by Gasha Kamal , a student at plastic art department college of fine arts /University of Sulaimani. There was also a beautiful Kurdish choir performance by students from the music department / college of fine arts under supervising Assistant lecturer ( Kumiko okomora ) . ڕۆژی ( 25 / 4 / 2016 ) زانكۆی ئه‌مریكی له‌ سلێمانی كوڕێكی خوێندنه‌وه‌ی شعری بۆ به‌رهه‌مێكی نوێی كتێبیكی شعری شاعیری كورد ( كه‌ژاڵ ئه‌حمه‌د ) سازكرد وه‌ له‌م ڕووداوه‌دا كه‌ زانكـۆی ئه‌مریكی له‌ سلێمانی و كولێژی هونه‌ره‌جوانه‌كانی زانكۆی سلێمانی ڕێكیان خستیوو بۆ گێرانی ئاهه‌نگێك بۆ ده‌سـكه‌وتی ئافره‌تان له‌ ده‌ره‌وه‌ی هۆڵـه‌كه‌ش له‌ به‌شی خوێندنه‌وه‌ پێشانگایه‌كی شێوه‌كاری نمایش كرا بۆ ( گه‌شه‌ كه‌مال ) كه‌ خوێندكاری به‌شی شێوه‌كاری كۆلێجی هونه‌ره‌جوانه‌كانه‌ هه‌روه‌ها كۆنسێرتێكی گۆرانی كوردی له‌ لایه‌ن خوێندكارانی میوزیكی كۆلێجی هونه‌رجوانه‌كانه‌وه‌ نمایش كرا به‌ سه‌رپه‌رشتی مامۆستا ( كۆمیكۆ ئۆكومورا ) .